More generally, the effort was credited with ratcheting up international attention, resources, and response efforts to the crisis. 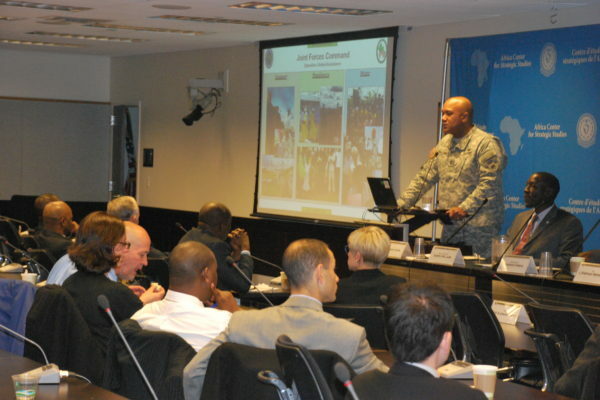 Recognizing that the Ebola epidemic continues to pose serious regional and global challenges, the first JFC-OUA Commander, Major General Darryl Williams reflected on some of the early lessons from this operation in a presentation to policymakers, security practitioners, scholars, and African diplomatic corps hosted by the Africa Center for Strategic Studies on December 2, 2014. Putting these accomplishments in perspective, General Williams emphasized that the JFC-OUA effort was just one element of a broader national, international, and interagency effort. Most vitally, from the outset the JFC-OUA was conceived and implemented as a support operation. Taking place in a sovereign state with a democratic government, the JFC-OUA was focused on supporting the efforts and capabilities of the Government of Liberia. Reflective of this approach, it was Liberian military engineers working 18 hour days, supported by the JFC-OUA, that completed the first ETUs. At the national level, it was the leadership and ownership of the process by the Government of Liberia that created an enabling environment for the international efforts to have any impact – and prospect for sustainment. The support role played by the JFC-OUA was similarly seen in its inter-agency coordination. USAID was the designated lead U.S. agency in the Ebola response. All JFC-OUA efforts, accordingly, were undertaken to bolster USAID’s overall strategy. This coordination extended to a wide array of governmental and non-governmental partners including the Center for Disease Control, the World Health Organization, the United Nations Mission for Ebola Response, and development agencies like Médecins Sans Frontières. This collaboration also involved the private sector, which was able to mobilize its staff, resources, and networks in support of the national awareness raising and containment efforts. Achieving this collaboration did not occur automatically but required concerted efforts to establish trust and assurances from the JFC-OUA that they were “not there to take over,” explained General Williams. This required spending extended time with these partners forging relationships. To reinforce this understanding, JFC-OUA forces were not allowed to carry weapons when engaging the public. “It is all about relationships, relationships, relationships,” General Williams stressed. These relationships, in turn, were the foundation of any progress the JFC-OUA was able to realize. 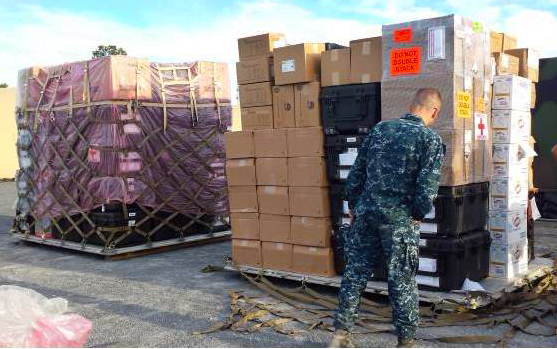 With these relationships in place the JFC-OUA was able to leverage its comparative advantages – logistics, planning, deployment of assets, and a command and control capacity – that were used to quickly establish key infrastructure needed to combat the virus. To do so required “constant communication from the strategic to the operational to the tactical and back up,” General Williams observed. Reflecting the non-traditional realities of this environment, the JFC-OUA Commander’s “daily battle rhythm” consisted of spending one third of his time engaging with U.S. interagency partners, the Government of Liberia (including the military) and international and local actors. Another third of his time was spent visiting ETUs and logistics support areas to assist and troubleshoot where necessary. The remainder of his time was focused on attending to internal and external communications as well as local and international media engagements. The priority given to the media was a recognition of the integral role that media played in the “communications and coordination” process and in tamping down on misinformation.